Acueducto del Águila, the Eagle Aqueduct - nerja. 19th century Aqueduct, also known as Eagle Bridge. Acueducto del Águila (Eagle Aqueduct), also known as Puente del Águila (Eagle Bridge), is regarded across the region as "an historic jewel of Spanish architecture". It was built in the 19th century and has been used continuously since - today the local community uses it to irrigate farmland. The aqueduct is situated on the Barranco de la Coladilla de Cazadores, to the south-west of the Caves of Nerja, and is visible from the N340 road linking Nerja town and Maro. 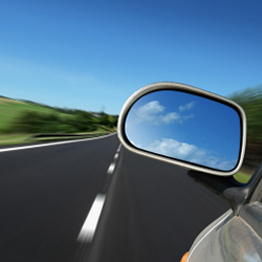 There is a layby where you can stop to get a good view and take photographs of the monument. The aqueduct was built between 1879 and 1880 (the exact date is not known) to aid the industrial revolution; it was intended to carry water from Nerja town to the local sugar refinery in Maro, Las Mercedes (also known as Fábrica San Joaquin de Maro, built in 1884), for irrigation. The aqueduct was commissioned by the factory owner, Francisco Cantarero Senio; his signature is visible in the central pavilion of the aqueduct. 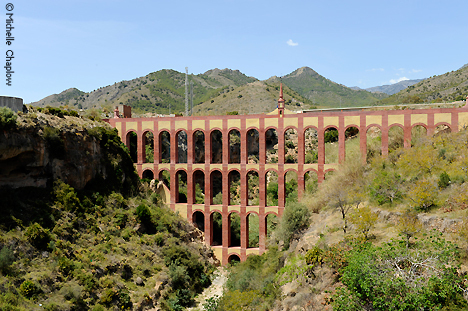 The factory is now closed but the aqueduct continues to be used for local irrigation. The design of the aqueduct is typical of the period of its construction (19th century), when the Mudejar style (copied from the ornamental architecture originally used by Muslim craftsmen in Spain between the 13th and 15th centuries) was very popular. The aqueduct is four stories high; each tier is constructed from a series of brick, horseshoe shaped archways, of which there are 37 in total. These are topped with a mudejar-style spire, on top of which is a weather vane in the shape of a double-headed eagle, from which the aqueduct takes its name. The origin of the eagle symbol is not known for certain, but it is rumoured that during the time of construction eagles were seen nesting in the hills of Maro. The face visible from the viewpoint is not actually the front of the construction, it is the back; the aqueduct faces north, as the old road passed on the other side. In the centre of the pavilion is a plaque which reads "Pura Y Limpia Concepción" (pure and clean conception), however the wear and tear of time has made this difficult to read. During the Civil War the aqueduct suffered direct hits from shells fired during naval bombardments. This damage has only recently been repaired; for most of 2011 the aqueduct was covered in scaffolding whilst renovations and repairs took place, however some of the damage is still visible. The project cost €514,000 and was financed by both the Junta de Andalucía and the Municipal Council. It has been officially named a Site of Special Cultural Interest by the Andalucian Government. As the area is public, there are no timetable restrictions and it is free to visit. However this also means that there are no services available; for cafés, toilets and shops, you need to go to nearby Maro or Nerja town. Off the Autovía del Mediterráneo (A-7) heading towards Almería, take Salida (exit) 295. The same route as to "Las Cuevas de Nerja", the aqueduct is signed from the road. It is also possible to walk from nearby Maro village; there are a number of pleasant walks and hikes around the area, you can find information about these in the tourist office.